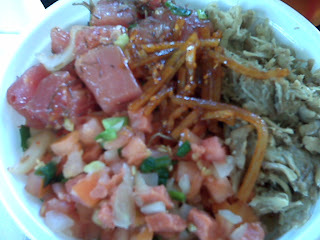 This is another one of my favorites at Paina Cafe, the Hawaiian Bowl. It's the large size poke bowl, I always get brown rice and I tried the spicy sauce this time (it's really not that spicy) along with limu ahi poke, kalua pig and lomilomi salmon (see previous post for an explanation) with the taegu (spicy cuttlefish). I took my Chi-town friends here for lunch before they headed back home. We all got poke bowls, pretty much the same except Toytoy had to get spicy tuna.